The first-ever 2019 BMW X7 also happens to be the largest BMW ever built. At BMW of Westchester, our staff is excited to show off this latest addition to the BMW lineup. Explore Westchester County and Yonkers roadways in this expansive three-row vehicle. We invite you to visit us today to take a test drive. A lease is a great way to experience this car, too. With a lease, you retain financial freedom but still get to drive the same great car, just without buying it. Choose from a pair of trims: the xDrive40i and xDrive50i. The base edition carries a 3.0-liter turbocharged V6 engine, which delivers 335 horsepower and 330 lb-ft of torque. The other X7 has a twin-turbocharged V8 engine, which makes 456 horsepower and delivers an extra kick when out on the highway. Both engines are mated to an 8-speed automatic transmission, with steering-wheel-mounted paddle shifters available to give you more control over shifts. The 16-way power front sport seats are comfortable, offering 4-way lumbar support. Of course, with the third row, there’s space for up to seven people inside the cabin, too. The 3-stage heated front seats keep you warm even on cold days, while the automatic 4-zone climate control keeps the temperature just right for everyone riding along. We know that you have a certain lifestyle and want to be able to maintain it. With a lease, you’ll have financial flexibility to make other important decisions when it comes to your money. A lease will be built around your specific needs, whether it’s the length of the term or the mileage you plan on driving each month. A lease will mean lower monthly payments each month than you would have with a loan. It also means the chance to upgrade to a new BMW every few years. Start the process by filling out the finance application on our website. Providing us with some basic information allows our financial team to get to work on lease terms before you even visit the dealership for the first time. For you, it means less time spent at the dealership going over paperwork. Though a lease may mean you’re only driving a car for a few years, it’s still important to take care of it while you’re driving it. That’s where our BMW-trained technicians come in. We’ll ensure your X7 is taken care of, with all regular maintenance performed in an efficient manner. Whether it’s an oil change, tire rotation, wiper blade replacement, or engine tune-up, we’re here to help. Use our online scheduler tool to schedule an appointment on our website, or get in touch with us on the phone during business hours. 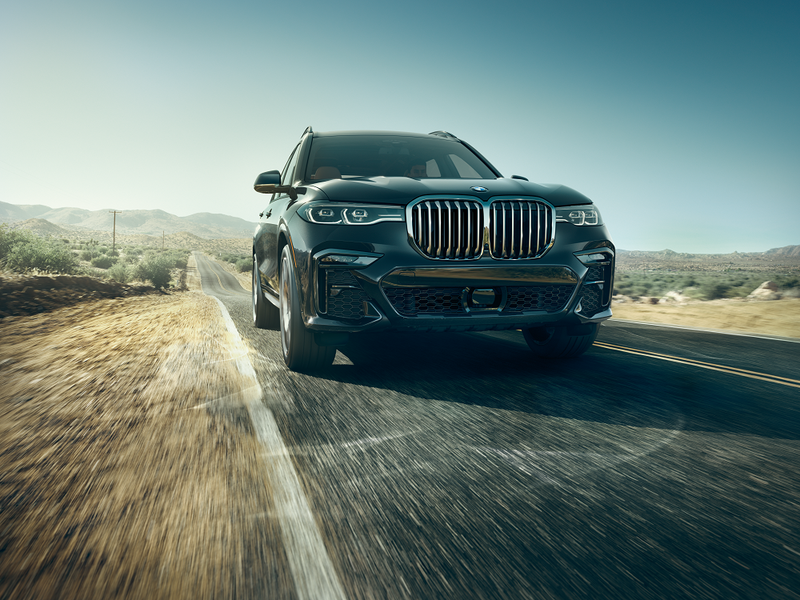 With this all-new model, the 2019 BMW X7, coming to BMW of Westchester, we think you might be interested in seeing it up close. Stop by the dealership to speak to one of our sales representatives and schedule a test drive to see how this three-row BMW Sport Activity Vehicle handles the roads of Westchester County and Yonkers. Then, sit down with our financial team to discuss the current X7 lease offers and find out the most convenient way to get behind the wheel.